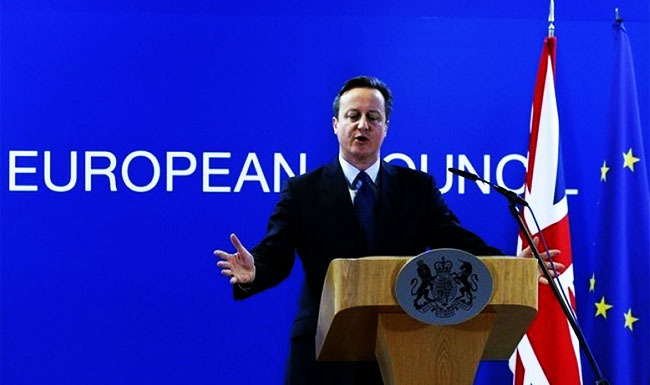 TheBlueGuerilla: Cameron Triumphant in Historic EU Reform Deal. DAVID CAMERON has returned from marathon talks in Brussels with an historic deal he is set to put to the public for an In/Out referendum on EU membership this summer, TBG can reveal. An exhausted looking Prime Minister exited the tough talks with 27 other countries claiming Britain now has a "special status" within the EU with the deal struck being "legally binding and irreversible". For the first time in history a British Prime Minsiter has battled for serious reform and a repositioning of Britain on the important stage that is the European Union. Keeping Britain at the table of influence the PM has landed some of the most important changes to the EU in recent history, even toying with its fundamental principles. The amending of EU treaties to state explicitly that references to the requirement to seek ever-closer union "do not apply to the United Kingdom", meaning Britain "can never be forced into political integration". The Italian Prime Minister Matteo Renzi warned "there is a risk of us losing sight of the original European dream".